Product prices and availability are accurate as of 2019-04-23 17:51:03 EDT and are subject to change. Any price and availability information displayed on http://www.amazon.com/ at the time of purchase will apply to the purchase of this product. Similar to gymnasts, tennis players and baseball pitchers, perspiration creates slipping problems when a firm grip is necessary to maximize their performance. 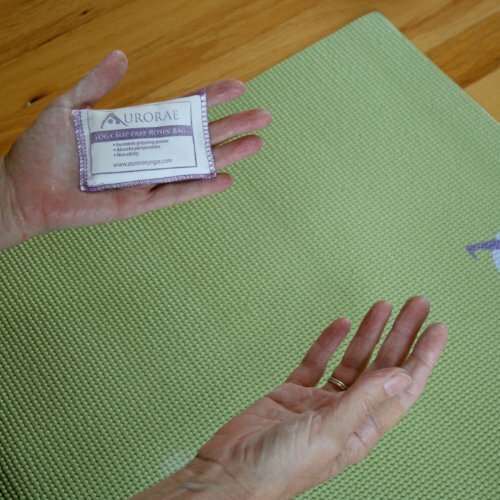 Our Aurorae Yoga Slip Free Rosin Bag increases your gripping power and absorbs perspiration with the slight touch of the bag. The Rosin should be applied to both your hands and feet before your practice and added as needed during your practice. Also put some on the mat itself where your hands and feet go for your downward dogs. The Rosin material derives from Nature. Most of the formula is from trees, plants and rocks. (calcium carbonate) Make sure powder settles before use to avoid inhaling or getting in your eyes. Please stop using if you notice any irritation or allergic reaction. Wash off easily with soap and water. Works incredibly well with our Yoga Sport Micro Fiber Towel to keep you from slipping on your mat. Sold separately. We at Aurorae are always looking for simple and cost effective ways to help you improve, as well as enjoy your practice. Remember "It's Your Yoga". Relax, Enjoy and Namaste. **SALE** You can buy as our Yoga Slip Free Package. 1 Sport Micro FiberTowel with Slip Free Rosin Bag or purchase as our Slip Free Stretch and Wash package (1 Rosin,1Towel,1 Mat wash,1Yoga strap) Great value and savings. Check out our latest Yoga Mat developments: 1) Aurorae Exciting New PRO Natural Cork/Rubber non slip Yoga Mat. Made from Portuguese Cork and Natural Rubber 2) Aurorae Super Sized "ULTRA" Super Sized Extra Long 78"; Extra Wide 26" and 1/4" Thick for comfort and Safety. Non Slip Rosin and Carry Strap included.